This recipe for Ukrainian pyrohy dough can also be used to make pyrizhky (small versions of pyrohy). Pyrohy are filled dumplings similar in shape to Ukrainian varenyky except that the former are made with yeast and baked, and the latter are not made with yeast and are boiled. The name comes from the word pyr meaning a banquet, indicating these dumplings were featured at special occasions in the old days. The fillings are limitless and sometimes, puff pastry or short pastry is used instead of yeast dough. When time is an issue, one large is made. Here is a larger photo of a slice of meat-filled pyrih. In a small glass, stir together sugar and yeast into lukewarm water and let stand 10 minutes. Place butter and scalded milk in a heatproof bowl or stand mixer and mix until lukewarm. Add eggs, salt, 1/4 cup sugar and yeast mixture. Knead in enough flour so the dough cleans the sides of the bowl. Continue to knead, adding more more flour as needed, until dough is smooth. Scrape down the sides of the bowl, cover and let dough rise until doubled. Punch down dough, knead a few times in the bowl, cover and let rise again. Have ready any filling like Ukrainian ground-meat (or any filling will work). 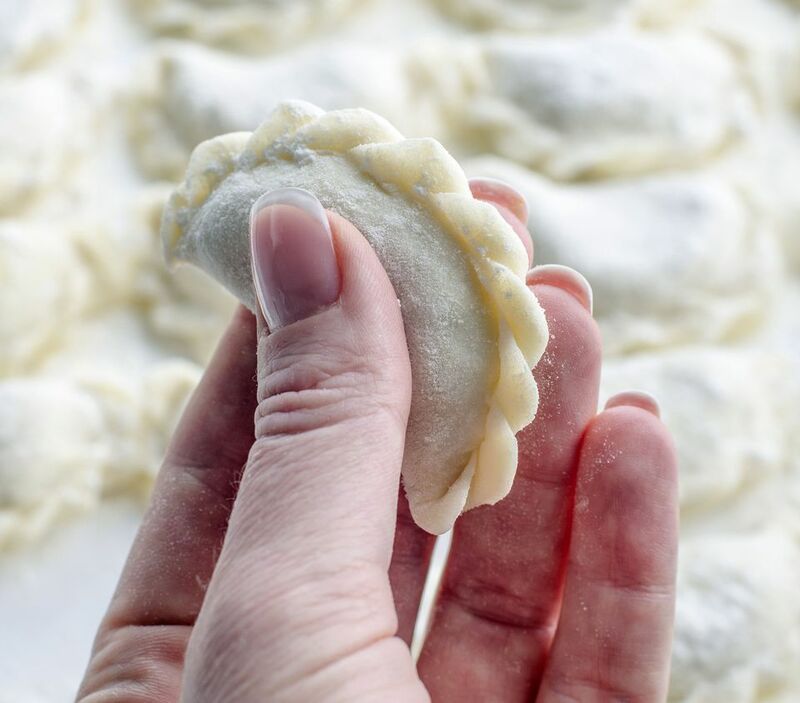 Making individual pyrohy, is the same as making pierogi. Roll dough 1/4-inch thick and cut out circles or squares of dough, fill, seal and place on a parchment-lined baking sheet. Cover and let rise until light, about 1 hour. Heat oven to 375 degrees. Carefully brush raised pyrohy with egg wash by beating 1 large room-temperature egg with 2 tablespoons water or milk. Bake 30 to 35 minutes or until golden. Serve warm. NOTE: To save time, make one large pyrih (singular of pyrohy) by dividing the dough in half. Roll one piece onto a parchment-lined baking sheet into a large rectangle. Spread the filling almost to the ends of the dough. Roll out the remaining piece of dough and place on top of the filled rectangle, crimping the edges. Prick in several places, cover and let rise as above. Brush with egg glaze and bake as above. Let rest about 10 minutes, cut into squares and serve warm.